Here in Australia we are fortunate to have some of the most beautiful birds you could ever see. The Bowerbird family is in my opinion up there with some of the most beautiful birds. Recently I did a trip for three days to O’Reilly’s resort, at Green Mountain, Queensland. This would have to be one of the best places in the country to see the two Bowerbirds’ featured below. The first bird featured here is the Regent Bowerbird. This bird has a beautiful golden colour on it’s head and wings and the remainig body is a contrasting black with a beautiful golden eye. 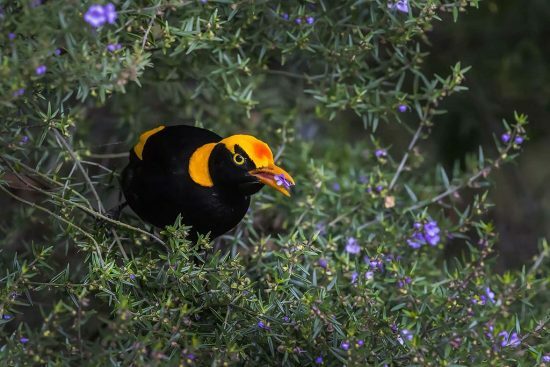 The Regent Bowerbird is a smallish, slim bowerbird with a longish, straight slender beak. 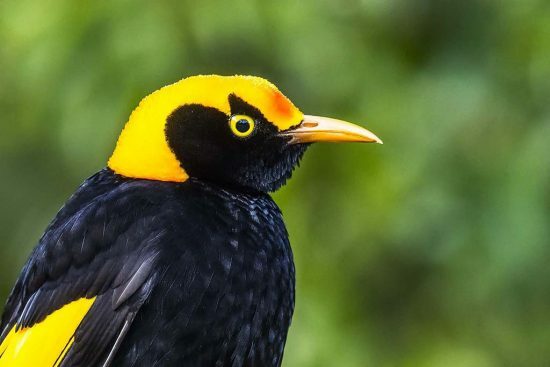 The male bird is a beautiful glossy jet black with bright gold on its head, nape and wings. The male’s bill and eye are bright yellow. The female is brown/black, mottled brown, with light brown markings on its back and breast. There are dark patches on the back of its head and on the lower part of the nape. The female’s bill is dark brown to black and the eyes are yellowish-brown. The immature male is similar to the female on its underparts and to the male on its upper parts i.e. head back and wings. The male’s tail is shorter than that of the female or immature birds. The male Regent Bowerbirds’ eyes become yellow in the second year of their life. I was fortunate to get an image of the bird feeding in this blue flowering shrub, he appeared to be eating the flowers. Below is a capture of his beautiful golden head. The two most prolific Bowerbirds up there were the above Regent and the Satin Bowerbird featured below. 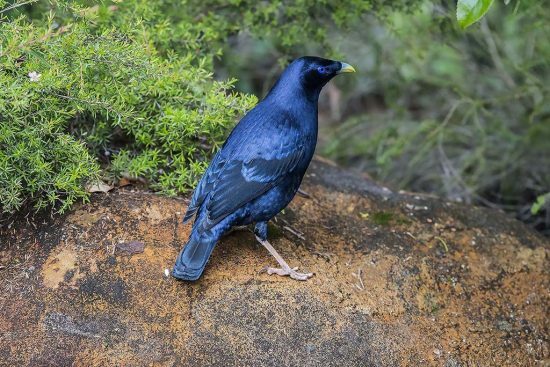 The first image below shows the beauty of the Satin Bowerbird with his glistening blue feather detail. Satin Bowerbirds are a medium sized bird. The adult male has striking glossy blue/black plumage, a pale bluish white bill and a violet-blue iris. Younger males and all females are similar in colour to each other, and are generally referred to as ‘green’ birds. They are olive/green above, off white with dark scalloping below and have brown wings and tail. The bill is browner in colour. Young males may begin to acquire their adult plumage in around their fifth year and are not fully developed until they are around seven years of age. One of the main activities of the bowerbirds is during their mating activities they construct a bower with a collection of coloured objects to attract their female companion to their particular area. 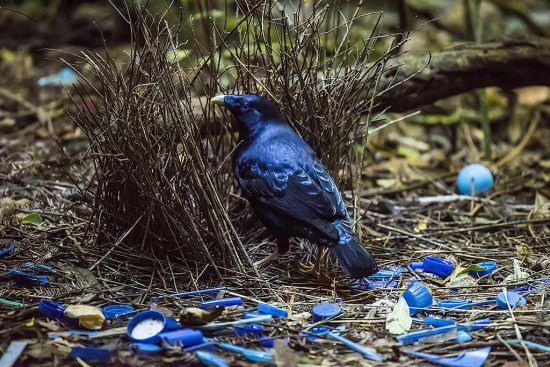 Above we have the Satin Bowerbird with his collection of blue objects while he tries to attract a mate. All his collected blue objects are coordinated to match his beautiful blue eyes. I captured all of the above images with the Nikon D810 camera and the 200-500mm f/5.6E ED VR AF-S lens. For more details of the Nikon 200-500mm f/5.6E super zoom lens take a look at the details on the following B&H link.